"Moriond", that's an important keyword in our collaboration. It's the winter deadline for many analyses, the occasion to see first results with the whole set of data collected in the past year. An important conference, one of the milestones of the year. But there's more actually: theorists and experimentalists brought together in an atmosphere favoring exchanges and discussion, confirmed and well-known scientists listening to young students presenting their work, and much free time to enjoy resources of the Italian Alps mountains (the conference is held in the 'La Thuile' winter sport resort). I've not attended many conferences myself, but if you ask me, free time between noon and 5PM is definitely a good idea! I had the great privilege to attend the electroweak session this year, and to present the analysis I'm involved in. I'm very grateful to my teammates for all the hard work, with a special mention to the coordinator of the analysis who pushed us to make it in time... For the actual presentation, I had five minutes to go over the full analysis, just enough to highlight a few ideas and results. I was a bit skeptical at first, but the format works actually well, and the young scientists sessions, jumping from one topic to another every 5 min, were quite animated and very interesting. "Winter deadline" I said. Well, we got a full review of state-of-the-art particle physics, and an impressive set of new results from particle physics experiments. 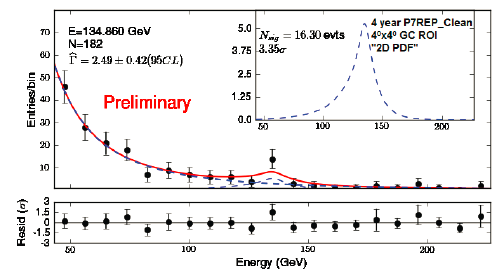 Unfortunately, despite the amazing variety of searches that are performed all over the world, the Standard Model managed to go through the conference without getting a scratch. Though, for those who really didn't want to return home with empty hands, we got a few curiosities, and we look forward to the follow-up. As an example, the Fermi-LAT collaboration presented results for the analysis of 4 years of data taking. This telescope is scrutinizing the sky at an impressive rate (20% instantaneous coverage, full scan in 3 hours), looking for WIMPs. After all, dark matter is currently one of the best experimental evidence that something is missing... One of the flagship analysis is the search for a ray in the energy spectrum of incoming photons. That could in particular be a sign of WIMP-like dark matter, that may produce this kind of rays in 2-to-3 co-annihilation processes, with a Bremsstrahlung photon. Another curiosity has been shown by the IceCube experiment, where they observed two neutrino showers at an energy of the order of 1 PeV... These are by 3 orders of magnitude "too soft" to be signal (GZK neutrinos), but current models predict only 1 event per year at the tenth of this energy, so this is quite intriguing. Here again, looking forward to more data! As a wrap-up, I can only encourage you to take a look at the experimental and theoretical summaries of the conference, that would give you a more fair idea of the set of results that were presented. I've definitely enjoyed my participation to this event, and if I can give an advice to my fellow PhD colleagues: do your best to attend next year's session! Julien Maurer is completing his PhD at CPPM, Marseille (south France). He has been involved in electron performance measurements and is currently looking for hints of strongly produced superpartners in lepton pairs. Could a new type of quark fix the “unnaturalness” of the Standard Model?